Cut off top 1/4- to 1/2-inch of each artichoke. Cut off the discolored bottom part of the stems. Using your hands, pull off any small, misformed lower leaves. Using kitchen shears, trim off the top sharp point of all remaining leaves. In a large stock pot, bring poaching liquid ingredients to a boil. Reduce heat to medium-low and poach artichokes until cooked through, about 20 minutes. When tender (check by piercing with fork), immediately transfer artichokes to a bowl of ice water. When cool, place stem-side-up in a colander to drain. Cut artichokes in half lengthwise, through the middle of the stem to the top. Using a soup spoon, scoop out the choke and purplish inner leaves. In a large sauté pan over medium-high heat, heat butter and virgin olive oil. Place artichokes, flat cut-side down, in pan and cook until browned. Turn artichokes over onto rounded side, add garlic and continue cooking until garlic is browned. Baste top of artichokes with the butter, olive oil, and toasted garlic mixture. 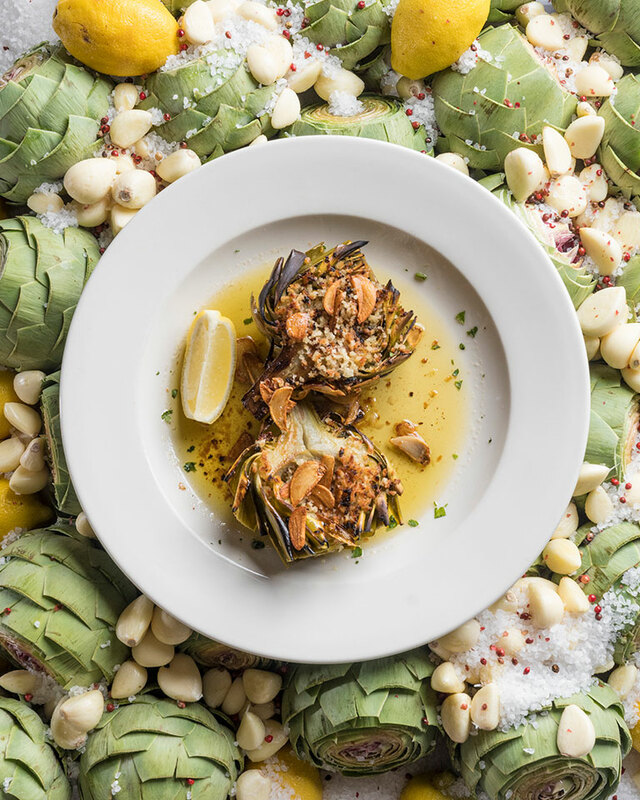 Transfer artichokes to large pan and roast in an oven preheated to 375ºF until heated through. Season with additional sea salt, cracked black pepper, and breadcrumbs; return to oven until bread crumbs are toasted.